ODA | A balanced diet . . . The United Kingdom is one of just a handful of countries that has committed to spend 0.7% of Gross National Income (GNI) on overseas development assistance (ODA or foreign aid) in support of the UN’s development goals. In fact that 0.7% target commitment is enshrined in UK law passed in 2015 (under a Conservative government), and the target has been met in every year since 2013. That’s something we should be proud of. Even the Tories should be proud of that. It seems, however, that many aren’t. For a variety of reasons, the aid budget is under threat. After years of government austerity and the decline of home-grown services (NHS, police, education, and the like) through under-funding, and as we lurch towards Brexit, the right-wing media and politicians are seizing every opportunity to ignore (or actively distort, even trivialize) the objectives of development aid and what it has achieved around the world. Or maybe they just lack understanding. In 2016, the UK’s ODA budget, administered by the Department for International Development (DFID), was just over £13 billion (almost USD20 billion). Check this link to see where DFID works and on what sort of projects it spends its budget. That budget has ‘soared’, according to a recent claim by The Daily Mail. In the post-Brexit referendum febrile atmosphere, the whole topic of development aid has seemingly become toxic with increasing calls among the right-wing media, headed by The Daily Mail (and supported by The Daily Express and The Telegraph) for the development budget to be reduced and instead spent on hiring more doctors and nurses, and other home-based services and projects, pandering to the prejudices of its readers. Such simplistic messages are grist to the mill for anyone troubled by the UK’s engagement with the world. There is unfortunately little understanding of what development assistance is all about, and right-wing politicians who really should know better, like the Member for Northeast Somerset (and the Eighteenth Century), Jacob Rees-Mogg have jumped on the anti-aid bandwagon, making statements such as: Protecting the overseas aid budget continues to be a costly mistake when there are so many other pressing demands on the budget. Now there are calls for that 2015 Act of Parliament to be looked at again. 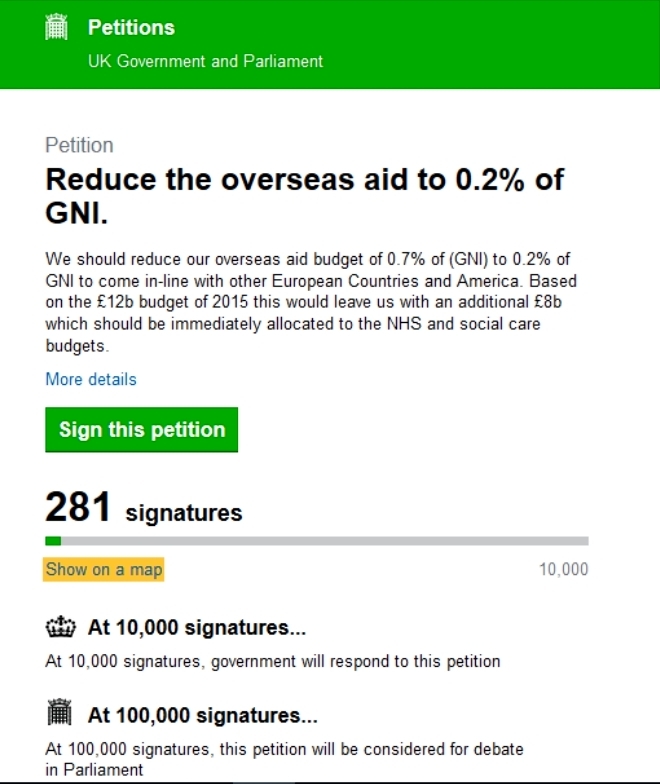 Indeed, I just came across an online petition just yesterday calling on Parliament to debate a reduction of the development aid budget to just 0.2% of GNI. However, 100,000 signatures are needed to trigger a debate, and as I checked this morning it didn’t seem to be gaining much traction. I agree it would be inaccurate to claim that all development aid spending has been wise, reached its ultimate beneficiaries, or achieved the impacts and outcomes intended. Some has undoubtedly ended up in the coffers of corrupt politicians. I cannot agree however, with Conservative MP for Wellingborough and arch-Brexiteer, Peter Bone, who is reported as stating: Much of the money is not spent properly … What I want to see is more of that money spent in our own country … The way to improve the situation in developing countries is to trade with them. As an example of the trivialization by the media of what development aid is intended for, let me highlight one example that achieved some notoriety, and was seized upon to discredit development aid. What was particularly irksome apparently, with a frenzy whipped up by The Daily Mail and others, was the perceived frivolous donation (as high as £9 million, I have read) to a project that included the girl band Yegna, dubbed the Ethiopian Spice Girls, whose aim is to [inspire] positive behavior change for girls in Ethiopia through drama and music. I do not know whether this aid did represent value for money; but I have read that the program did receive some positive reviews. However, the Independent Commission for Aid Impact raised some concerns as far back as 2012 about the Girl Effect project (known as Girl Hub then). From their blinkered perspectives, various politicians have found it convenient to follow The Daily Mail narrative. What, it seems to me, they failed to comprehend (nor articulate for their constituencies) was how media strategies like the Girl Effect project can effectively target (and reach) millions of girls (and women) with messages fundamental to their welfare and well-being. After being in the media spotlight, and highlighted as an example of ‘misuse’ of the aid budget, the support was ended. In a recent policy brief known as a ‘Green Paper’, A World for the Many Not the Few, a future Labour government has pledged to put women at the heart of British aid efforts, and broaden what has been described by much of the right-wing media as a left-wing agenda. Unsurprisingly this has received widespread criticism from those who want to reduce the ODA budget or cut it altogether. But in many of the poorest countries of the world, development aid from the UK and other countries has brought about real change, particularly in the agricultural development arena, one with which I’m familiar, through the work carried out in 15 international agricultural research centers around the world supported through the Consultative Group on International Agricultural Research or CGIAR that was founded in 1971, the world’s largest global agricultural innovation network. In a review article¹ published in Food Policy in 2010, agricultural economists Mitch Renkow and Derek Byerlee stated that CGIAR research contributions in crop genetic improvement, pest management, natural resources management, and policy research have, in the aggregate, yielded strongly positive impacts relative to investment, and appear likely to continue doing so. Crop genetic improvement research stands out as having had the most profound documented positive impacts. Substantial evidence exists that other research areas within the CGIAR have had large beneficial impacts although often locally and nationally rather than internationally. In terms of crop genetic improvement (CGI) they further stated that . . . estimates of the overall benefits of CGIAR’s contribution to CGI are extraordinarily large – in the billions of dollars. Most of these benefits are produced by the three main cereals [wheat, maize, and rice] . . . average annual benefits for CGIAR research for spring bread wheat, rice (Asia only), and maize (CIMMYT only) of $2.5, $10.8 and $0.6–0.8 billion, respectively . . . estimated rates of return to the CGIAR’s investment in CGI research ranging from 39% in Latin America to over 100% in Asia and MENA [Middle east and North Africa]. DFID continues to be a major supporter of the CGIAR research agenda, making the third largest contribution (click on the image above to open the full financial report for 2016) after the USA and the Bill & Melinda Gates Foundation. At £43.3 million (in 2016), DFID’s contribution to the CGIAR is a drop in the ocean compared to its overall aid budget. Yet the impact goes beyond the size of the contribution. I don’t believe it’s unrealistic to claim that the CGIAR has been a major ODA success over the past 47 years. International agricultural research for development has bought time, and fewer people go to bed hungry each night. Nevertheless, ODA is under threat everywhere. I am concerned that in the clamour to reduce (even scrap) the UK’s ODA international collaborations like the CGIAR will face even more funding challenges. In Donald Trump’s ‘America First’ dystopia there is no certainty that enormous support provided by USAID will continue at the same level. Most of my professional career was concerned with international agricultural research for development, in South and Central America (with the International Potato Center, or CIP, from 1973 to 1981) and the International Rice Research Institute (IRRI) in the Philippines (from 1991 to 2010). The conservation of plant genetic resources or agrobiodiversity in international genebanks (that I have highlighted in many stories on this blog) is supported through ODA. The crop improvement programs of the CGIAR centers like CIMMYT, IRRI, ICARDA and ICRISAT have released numerous improved varieties for use in agricultural systems around the world. Innovative research is combating the threats of new crop diseases or the difficulties of growing crops in areas subject to flooding or drought². This research (often with critical links back into research institutes and universities in donor countries) has led to improvements in the lives of countless millions of poor people around the world. But the job is not finished. Populations continue to grow, with more mouths to feed. Civil unrest and conflicts continue to blight some of the poorest countries in the world. And biology and environment continue to throw challenges at us in the form of new disease strains or a changing climate, for example. Continued investment in ODA is essential and necessary to support agricultural research for development. Agriculture is just one sector on the development spectrum. Let’s not allow the likes of Jacob Rees-Mogg, Peter Bone, or The Daily Mail to capture the development debate for what appear to be their own xenophobic purposes. ² In another blog post I will describe some of this innovative research and how the funding of agricultural research for development and greater accountability for ODA has become rather complicated over the past couple of decades.